There are 2 companies that run bicycle tours of Stanley park. 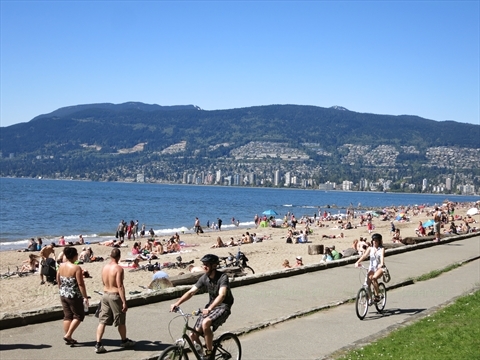 Cycle City Tours offers 2 daily tours: The Stanley and The Grand Tour which tour Stanley Park. During regular season, the Stanley runs Monday to Friday at 1pm and Saturdays/Sundays at 9:30am. It is approximately 3 hours long and covers about 9km for $59 plus bicycle rental. It is easy and good for all biking abilities. During the winter season (Nov-Apr) the Stanley tour departs 10am dailr for a 2 hour tour for $49.00. The Grand Tour departs daily at 10am, is about 4.5 hours and 20km for $85.00 including bike rental. It is easy to moderate. Online bookings are open until 24 hours prior to the tour. The tour starts and ends at Spokes Bike rental shop at corner of Denman and Georgia streets. Another company offering a Stanley Park bicycle tour is Vancouver Bike Tours. It seems to have a 9:30am tour called 'Towers and Totems Bike Tour' which goes to Stanley park. The cost is $30 plus bicycle rental. It is 3 hours and about 18km. It appears that it starts at English Bay Bike rentals at 1754 Davie Street in the west end.